Price of raw jute is much higher this year thanks to the rising demand at both home and abroad owing to the environmental benefits of jute-made products. Jute farming has increased in the country over the past few years as the jute farmers are getting fair price of their produce. Jute is the second most important fibre crops after cotton in the world and the main cash crop in Bangladesh. Around 4 to 4.5 million small and subsistence farmers depend on jute farming for their livelihoods. Regional field reports show that jute acreage has increased notably in the country over the last few years. Acreage of jute farming increased by 10 per cent to 0.79 million hectares this year, according to the Department of Agriculture Extension (DAE) data. Price of newly retted Tossa jute currently stands at Tk 1800-Tk 2300 while indigenous raw jute is selling at Tk 1650-Tk 1800 per maund, according to the Department of Agricultural Marketing (DAM) data. The current price is over 30 per cent higher than the price of last year, according to DAM. However, the production cost of jute has also increased this year while untimely rain in some areas damaged 30 per cent of jute crops in Faridpur region, local sources said. Mukter Hossain, a jute grower at Joduboira of Kumarkhali Upazila in Kushtia, said jute production cost has increased due to higher input price but a rise in raw jute price helped the jute farmers cope with the increased input cost. Local sources said Tossa variety of jute was trading at Tk 1900-Tk 2300 per maund in last few weeks in Kushtia, Rajbari, Vanga and Nagarkanda, Moksudpur, Pangsha, and Kalindi area in Faridpur region. Both the price and production of jute are good in Pabna, Jessore, Magura, Kushtia and Manikganj districts. Jute price stood between Tk 1,250 and Tk 1,400 (local) and Tk 1,600 and Tk 2,000 (tossa) per maund in local markets in 2016. DAE Field Service Wing additional director Alhaz Uddin Ahmed said the acreage of jute has been increasing in the country in the last couple of years as farmers are getting fair price of jute crops. Though the adverse weather conditions damaged jute crops in some areas, this will not affect the overall jute production this year, he said. 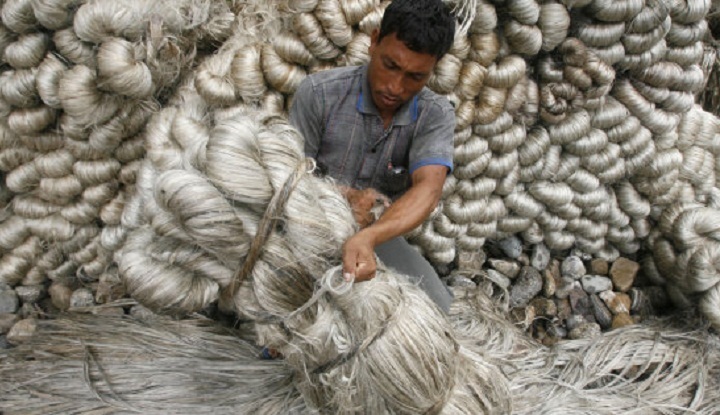 However, the target of jute production is 84.44 lakh bales from 7.58 lakh hectors of land this year which would be tough to achieve, said the market insiders. The country’s jute production stood at 88, 94,683 bales in FY 2017-18 and 82, 46,801.9 bales in FY 2016-17. To help local mills in collecting required supplies of raw jute, the government imposed a ban on raw jute export last year. State-run Bangladesh Jute Mills Corporation (BJMC) has a target to purchase 2.5 million tonnes of raw jute this season through its 64 purchase centres. The purchase started from the first week of August and the Corporation so far collected around 10 per cent of their requirement, according to BJMC.